Each cone represents a life that was lost in a work zone traffic crash in the state of Texas in 2018. WICHITA FALLS, TX (TNN) - While numbers are down from 2018, TxDOT officials continue to remind drivers to stay alert and slow down when construction is underway. On Monday, 161 orange cones lined the driveway of TxDOT’s headquarters location on Southwest Parkway to help spread awareness of the importance of driving safely in construction zones. "It's a good time to start talking about this because we are going into our busy season," said Adèle Lewis, the public information officer for TxDOT. "It's all about taking the keys and making sure that you're the best driver you can be in a work zone," said Lewis. In the middle of this site, a large cone can be seen with black tape around it. Lewis said that cone represents the only Texas highway construction worker who was killed in the line of duty in 2018 out of the 161 fatalities. "84 percent of the people last year that were killed in a work zone were the drivers and their passengers," said Lewis. 25,162 work zone traffic crashes were reported in the state of Texas in 2018. Lewis said 93 of them were in the Wichita Falls District. 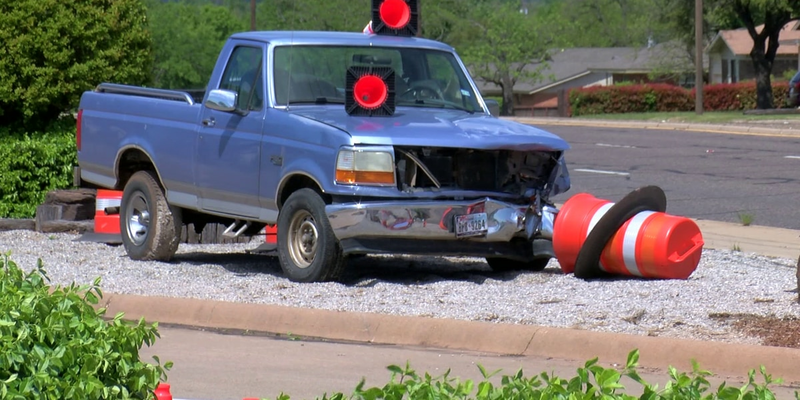 TxDOT officials said accident reports always point to speeding and distracted driving, which includes being on your cell phone and ignoring traffic control signs and flaggers. During this national work zone awareness week, TxDOT officials are encouraging drivers to put down the phone, slow down and pay attention. TxDOT officials are also reminding drivers of the Move Over/Slow Down law. The law requires drivers to move over a lane or reduce their speed to 20 mph below the posted limit when they see flashing blue or amber lights on a TxDOT vehicle, emergency vehicle, or tow truck stopped on the roadside or shoulder. The TxDOT display will be up to see until Thursday, April 18.